The more it eats, the more it grows. Can the local bad boy (Steve McQueen, in his first leading role) save his 'burb from the sinister slime--and reform himself in the process? High-quality Criterion Collection edition with extras! Local teenagers, who have witnessed its obscene display of hunger, are ignored until it seems that it's too late. "Beware of the Blob!" 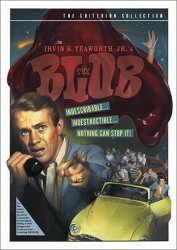 One of the great cult classics, The Blob melds '50s schlock sci-fi with teen delinquency pics even as it transcends these genres with strong performances and ingenious special effects. Made outside of Hollywood by a maverick film distributor, a crew experienced in religious and educational shorts, and a collection of theatrical talent from Philadelphia and New York, The Blob helped launch the careers of superstud McQueen and composer Burt Bacharach. Special Features include: New widescreen digital transfer, enhanced for 16x9 televisions with restored picture and sound two audio commentaries theatrical trailer Blob-abilia! special collectible poster and more!